Harrison Weir with his menagerie. A self-portrait, drawn for Dartons “Brave Boys” c1890. The void left by the death of Sir Edwin Landseer has been worthily filled by the subject of this sketch. But there is this difference between the two artists – one devoted his brush to painting great works for the picture galleries of the aristocracy, the other has devoted his genius for the delight and edification of the million. Now of the two artists who have made animal painting their especial pursuit, commend to us Harrison Weir, and for the simple reason that larger results have been obtained by him. Let us not be misunderstood in this; from an artistic point of view, Sir Edwin’s pictures stand unrivalled, and will serve as models of art for ever; but then so much of their moral value is lost by their being in the possession of some lord or connoisseur, and therefore they can give pleasure but to few. True, the are engraved from, yet they are sold at a price which make them unavailable to the people. But the graphic works of Harrison Weir come to us in most of our weekly magazines, and he has a household welcome, because he is the painter who does so much for the happiness of home and the education of our children, in the interesting traits connected with animal history. The numerous juvenile magazines are kept alive by his genius. Through his genius the best feelings of our children are developed towards dumb animals, and he has presented them to us in such a loveable manner that old and young, all the world over, are taught to be their loving friends. There is no estimating the great moral service that Mr Weir is doing by adorning so liberally the cheap literature of the day; and what a loss it would be to society if he hid his talents under a bushel by shutting himself up in his studio and painting a picture for the gratification merely of some wealthy man and his friends. Whether in art or literature, it is he that devotes his genius for the universal good deserves the most honour. Harrison’s favourite dog “Rover” who regularly used to accompany him from Weirleigh to the local Railway Station at Paddock Wood, where he would patiently wait, under the watchful care of locals and railway staff there, for his master to return. “By their works ye shall know them” is a scripture aphorism, but to apply it to temporal affairs all must accord to Mr Weir the well-earned title of being the “animal’s friend,” for he has not laboured more assiduously to bring before us the beautiful traits and instincts that all animals more or less have, if we would only take the pains to make better acquaintance with them, and removed from our minds many vulgar errors that we have fostered towards them. We have often watched the effect of his pictures on the family circle; we have seen tears of pity shed over some suffering animal, as well as smiles of delight at the comic pranks of others. And in teaching kindness to animals it is sure to develop in us more kindness towards each other. Kindness is the surest way to reach the human heart; it makes sunshine wherever it goes; it finds its way into hidden chambers of the heart, and brings forth golden treasures. Harshness, on the contrary, seals them up for ever. Kindness is the real law of life – the link that connects earth with heaven. Then what a noble phase of it it must be to be kind to those creatures who cannot express their sufferings to us, and who are at our mercy! A word of kindness is a seed which, when dropped by chance, springs up a flower. And we beg to enforce upon the attention of our young readers the vast importance of kindness to animals, and they will reward you by showing you how happy you have made them. The inevitable shortness – for they are not, like you, to live the immortal life – of their existence should plead for them touchingly. The insects on the surface of the water, poor ephemeral things, who would needlessly abridge their dancing pleasure of to-day? Such feelings we should have toward the whole of animate nature; and such feelings we are taught to observe by the study of Harrison Weir’s delightful pictures. “Going to the Doctor”, a dog leads his injured friend to the house of a Doctor. 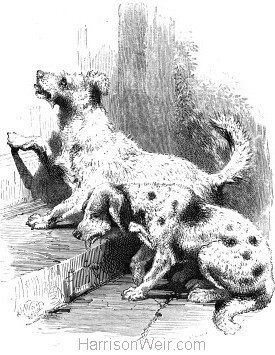 Image from “Our Childrens Pets”, by Josephine. Published by S.W.Partridge, London, 1865. It is said that the three indispensables of genius are understanding, feeling, and perseverance. Now what is seen cannot be denied; therefore, we affirm that Harrison Weir has all these attributes, and we point to his thousand pictures as a proof of it, notably those in “Chatterbox,” “Children’s Friend,” “British Workman,” “Band of Hope,” and other works for the young. The amount of work his pencil turns out through the year is something marvellous, when we consider its excellence, and when it is known that for more than twenty years he has never been more than a day without pain, and oft-times of the most excruciating kind, and is now a confined invalid. Here it is before us, for hardly a book or magazine for the young can we look at but has one or more of his genial pictures connected with animal life, from a mouse to an elephant – from the swallow, twittering in the straw-built shed, to the soaring eagle. But the artist must love the thing he draws, or his pictures would not afford us that delight which they do; there is nothing conventional about them, they are life-like portraits, and no doubt most of the animals have sat for them. Frontispiece from “Bird Stories Old and New” which contains narratives and anecdotes of birds and other animals, some associated with Harrison’s residence at Weirleigh. Published by the Society for the Promotion of Christian Knowledge, engraved and printed by Edmund Evans. c1885. What happiness among the animal creation there must be at Weirleigh, the residence of our popular animal painter! ** We are told that he entertains quite a menagerie of domestic animals, and that they have all learned to love and obey him; and has he not often and often given us the inimitable portraits of his cats, dogs, fowls, ravens, birds and horses? And what a beautiful collection they make, and the variety of wholesome lessons they teach the young lords of creation who have dominion over them! Like many other great men, there is but little known of Mr Weir, except through his works – no one less, indeed; and it seems as if that modesty which is always allied with true genius prevented him to make his life in any way known to the public. But the little of his private life that we have gathered, we are sure that he will forgive us for publishing it. Well, then, Harrison Weir was born at Lewes, in Sussex, May the 5th, 1824. His father held an appointment in a bank there, and he apprenticed his talented son to Mr Baxter, the patentee of oil-colour printing, to learn the art; but the youth very soon showed his genius for drawing, by making some striking sketches from nature of various animals, as well as landscapes. He was always partial to country life, and lost no opportunity in indulging his tastes. Soon after the commencement of the “Illustrated London News” Harrison Weir used to make sketches for that paper, and continued to do so for a number of years, with remarkable success. He also became a member of the New Society of Painters in Water Colours, and was a constant exhibitor at their animal exhibitions. He is so good a judge of horses and dogs, pigeons and birds, that he has often been selected as umpire in deciding their respective merits at prize shows, and for nineteen consecutive years acted as judge at the great Birmingham Show. He also originated the first Cat Show held in England, and these animals are now judged by the rules drawn up by him. This he instituted with the hope of making the cat have more kindness and attention given to it than heretofore. Besides being the most popular of living animal painters, he is the best of friends. Friendship, with him, means more than a name – it is a sacred feeling, and neither lightly taken up nor put aside. He has an abhorrence of conventionalities, and likes men to stand in the native mould in which the Creator has made them, and not to lose their individualities in others. * What an amazing testimony to an obviously rich and endearing friendship! ** Weir sold his residence “Weirleigh”, in Brenchley Kent, in 1885, to the wealthy businessman Sassoon, father of the famous War Poet, Siegfried Sassoon, who was born there later that year. This would suggest that this article, although in this case published c1890, had been written and possibly published earlier. Weir had moved to Henwick Lodge, 34 Landsdowne Rd, Tunbridge Wells, probably as early as 1884 as several of his autograph letters extant in our files, are written from there. It is also possible he may have gone there initially to convalesce, and then susequently made the decision to sell.